“Not only are you able to assist and care for children in need, but it is rewarding to see the difference that you can make to these young children and their families while they are experiencing challenges”. Brigitte Baker from Cairnlea is Brimbank’s Citizen of the Year 2014. She’s truly an inspirational women and one we can all admire and look up to. She lives and breathes simple values of respect, care, loyalty and commitment. Those are simple values to say, not so simple to demonstrate. 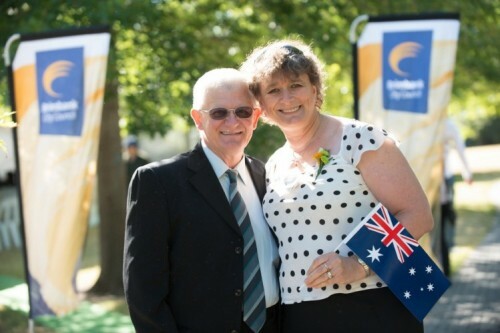 Brigitte was announced Brimbank’s Citizen of the Year at the Australia Day Awards in January. When the reasons for her nomination were read out to the throng of guests present, I can guarantee there wasn’t a dry eye in the house. So what’s so special about Brigitte? Well, in addition to raising her own family, now adults, she is an amazing and much loved volunteer at University Park Primary School. She is president of the school’s Parents and Friends Association and is tireless in her efforts to raise much needed funds for resourcing the school. She also inducts new families and makes students and parents welcome to help them fit in to a new environment. While giving hours of her time to the local Primary School, in the background she continues to foster children who have often experienced grief, loss or trauma. So, Brigitte is a foster Mum...that’s great – but lots of caring people are out there quietly going about their business fostering kids. But not everyone is like Brigitte. She and her husband have been fostering kids for the last 27 years! Yes, that’s right - 27 years!! And how many kids has she helped?? You won’t believe it, but more than 600 children have found a safe haven in her home. Brigitte has fostered children who have needed help to stay out of trouble. Some of those kids have been through so much. The challenges Brigitte faces includes learning how to manage behavioural issues related to various psychological and physiological disorders, assisting children to feel welcome and comfortable into a healthy family environment, providing children with patience, emotional support and additional attention through periods of hardship. To be a successful foster Mum means being prepared for times that can be personally challenging and knowing there is always assistance available to carers either in the form of emotional support and advice or with professional training. Brigitte says that the most satisfying element of her work is ‘the wonderful and rewarding experience not only for me, but for the whole family. Not only are you able to assist and care for children in need, but it is rewarding to see the difference that you can make to these young children and their families while they are experiencing challenges”. Brigitte and her husband Robert, who has shared the load and helped Brigitte help hundreds of kids in need. Hats off to an inspirational Brimbank woman who thinks what she does is no biggie – she says she’s just fortunate and loves being helpful. Brigitte is a true local hero who has helped hundreds of kids get through tough times.